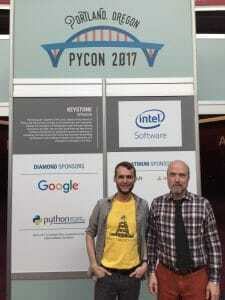 This week's PyDev of the Week is PyCon Canada co-founder David Wolever! Come find out more about David, how he got his start with Python, and what he's up to these days. This week we welcome David Wolever (@wolever) as our PyDev of the Week. David is the co-founder of PyCon Canada and Akindi.com – a small company that’s making multiple-choice bubble sheet tests a little bit less terrible. He is also the author of the nose-parameterized project and the pprint++ project. You can also check out what other projects he contributes to on GitHub. Let’s take a few moments to get to know David! I’m a long-time Python fan and startup founder from Toronto, Canada. I dropped out of software engineering at the University of Toronto when I realized that I was interested in building software, not proving runtime bounds of graph search algorithms (although I’m incredibly grateful to the people who do enjoy that), and I’ve been working with small startups ever since. I’m the CTO of my company, Akindi, which makes Scantron-style multiple choice bubbles sheets a little bit less terrible. Outside of computers, I’m really into knots (top three: alpine butterfly, jug sling hitch, chain sinnet) and motorcycling. My favorite language, though, is SQL. I take an unhealthy amount of joy from working with SQL (and, specifically, PostgreSQL). The next language I invest in will be something with a strong, static, type system. Maybe Flow? TypeScript? I’m not sure yet. But I’m tired of all the time I waste on issues the computer should have detected for me. My main project is my company, Akindi. Our product is a Scantron-style multiple-choice bubble sheet grading system that’s less terrible than anything else on the market. (Un)fortunately, we’ve grown enough that I don’t get to do much coding day-to-day, though. git-blast, which shows git commits sorted by last commit date. parameterized, a parameterized testing library that works with every testing framework. pprintpp, a drop-in replacement for the pprint module, but it’s actually pretty. gevent: I love gevent’s implementation, and the API it exposes is easily the best concurrency API that exists for Python. It’d be awesome if there was a similar API for threading and multiprocessing. pathlib: is really nifty, and I haven’t regretted using it yet. pandas: oh gee is Pandas ever great. I smile every time I get to use it. pdb++: I love debugging with pdb, and pdb++ makes it much nicer. That’s a fantastic question, and my honest answer is that I’ve got no idea. I hope, though, that the effort to build clean, usable APIs will continue. Python’s APIs are steadily getting better… but I still have to check StackOverflow each time I need to convert a datetime to a timestamp or vice versa. It’s annoying! Because everyone wants to hire them, which is making it really difficult for me to hire them. str.partition is incredibly useful and almost unheard of. Everyone should use str.partition!